The world of marketing is ever-changing. After all, remaining effective means constantly keeping on-trend. One thing that won’t be going off-trend anytime soon is something we call location-based marketing. Location-Based Marketing, as described by Rori Duboff, Global Head of Strategy at Havas Media, is “being able to connect with the consumer in a meaningful way – in the right place, at the right time, with the right message.” So, while it may be true that “it’s not where, but who you’re with that really matters,” when it comes to effective real-time marketing, location takes the cake. It’s also important to note that location-based marketing has allowed – and will continue to allow – brands to be more interactive, more social, and more connected than ever to consumers by allowing brand-consumer interactions to be more personal and less generalized. Location-based actions, also known as LBAs, have been a huge shifter in social media for business. LBAs have been deemed the ROI of social because it connects a social action to an actual, in-store visit. In fact, based on the Restaurant Social Media Index’s (RSMI) overall LBA data, $12.6 billion in revenue has been attributed to location-based actions. There are three different types of LBAs that the RSMI tracks: direct check-ins, intent to visit, and return & refer. There are also specific elements within an LBA that the Index tracks in terms of scoring: density, frequency, sentiment, and return and refer, all of which we break down in our 2013-2014 Location-Based Action Report. 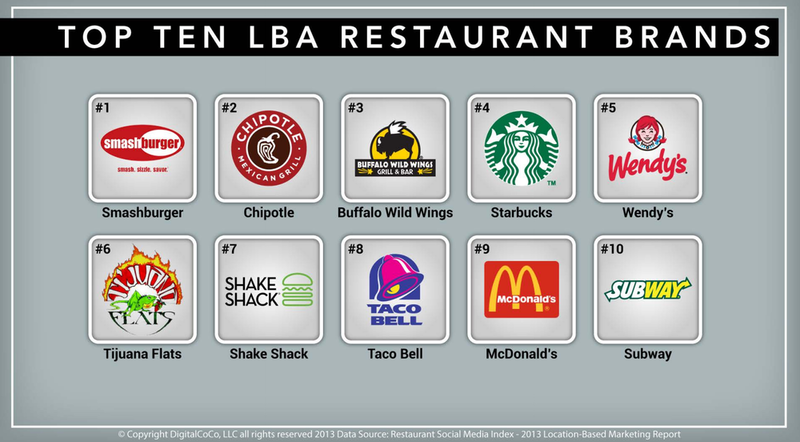 It’s also interesting to see how restaurant consumers are interacting with brands and how these LBA-heavy brands are making the ranks. 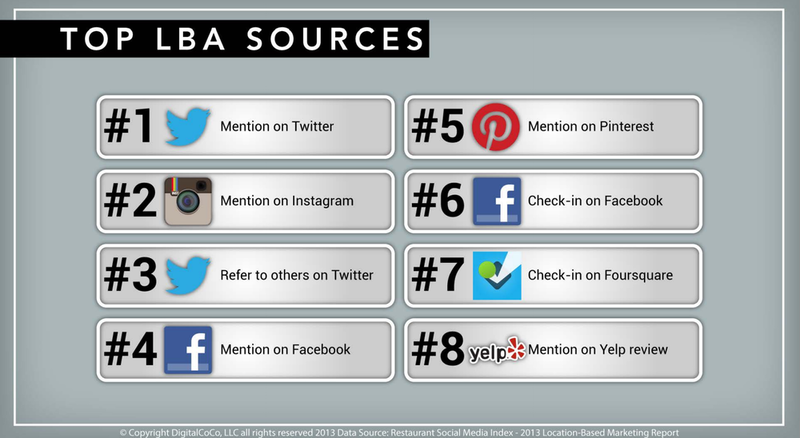 Pulled from RSMI data, the following list is a ranking of how consumers are driving LBAs. Note: Though there has been a significant upward trend in overall location-based actions, we are seeing a downward trend in direct location-based check-ins. Since this time last year, there has been a 43% drop in Foursquare check-ins. This makes sense considering Foursquare has had a bit of trouble over the past few years in a couple of different ways, including: (a) differentiating itself from other social platforms, many of which have integrated direct check-ins, and (b) figuring out how to monetize its model. DigitalCoCo Founder and CEO Paul Barron breaks down the qualms of Foursquare in this article. However, it wouldn’t be fair to say this downfall comes from lack of trying to reposition or rebrand itself. To our most recent knowledge, Foursquare is using all of its preexisting check-in data to provide recommendations and referrals based on a consumer’s location. For example, if a Foursquare user checks in to a restaurant, a notification with a user-generated recommendation of what to order may pop up. 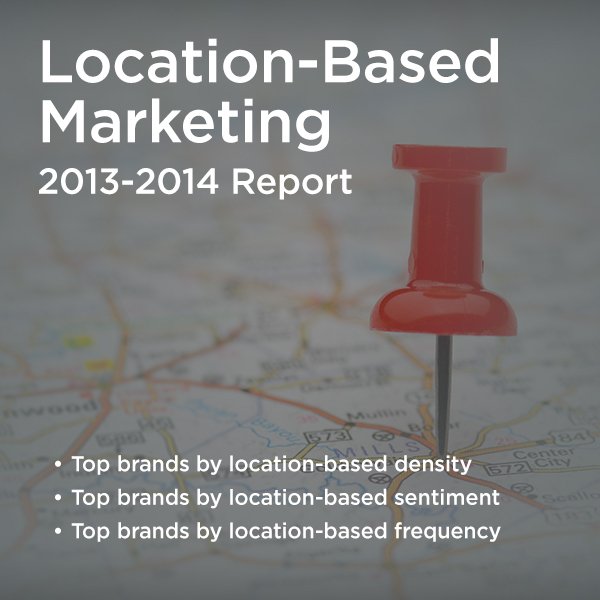 How can restaurants maximize location-based strategies? What are some effective ways to increase LBAs for your restaurant? Which foodie cities are rocking the top LBAs in relation to the restaurant industry? What is the future of location?